Our product range includes a wide range of digital timer. 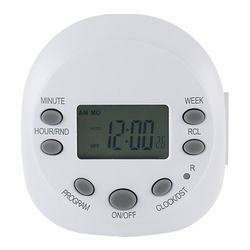 Keeping in tune with the latest demands of our prestigious clients, we are actively engaged in offering Digital Timer. These protection relays can be detached from the body so that the causes of the fault can be ensure without opening the distribution panel door. Our offered protection relays are manufactured by advanced technology & finest quality of material under the supervision of our skilled personnel. Also, customers can avail these protection relays from us in various specifications according to their choices. Looking for Power Contactor ?